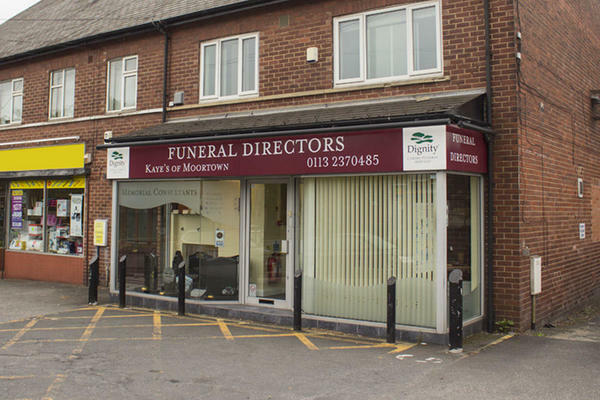 Kaye's of Moortown Funeral Directors are based in Moortown, Leeds. We believe that life with those we love is deeply personal, and that a funeral service should reflect this. We want to help our local community by arranging bespoke funerals, celebrating the lives of our loved ones in a personal and meaningful way. Whatever type of funeral you feel is most fitting for your loved one, we are here to help you make it happen. We have a wide range of experience in conducting all kinds of funeral services, and no detail is too large or too small. We will make the arrangements on your behalf, to help ease the stress that can come with planning your loved one's farewell. Our funeral home is easily accessible from the surrounding areas, including Moortown, Moor Allerton, Primley Park and Roundhay. You can reach us at any time too, our telephone line is in operation 24 hours a day to ensure you can always contact us when you need us most. Call us today on 0113 237 0485 to talk through your personal requirements. At Kaye's of Moortown Funeral Directors, we understand how special life is with those that you love. For us, every funeral is unique and personal. We have a service to fulfil every wish, with every detail carried out with the same uncompromising quality of care. From a traditional service, to a colourful woodland burial, your options are limitless with our Full Service Funeral. If you have a little more flexibility when it comes to arrangements, then we can provide a Simple Funeral for a lower cost. We are next to the Co-op supermarket at the top of Harrogate Road, just before the Ring Road. Our staff are available 24 hours a day on 0113 237 0485 if you require our services outside of these hours. Kaye's were extremely sympathetic and professional in all our dealings , including the funeral itself. Provided expertise and understanding during difficult time. Thank you for taking the time to complete the online review. I am pleased we were able to help make things easier for you at such a difficult time and that we were able to provide you with the support and guidance needed. We recently used your service for my husbands funeral, the staff made a difficult time more bearable and were professional and courteous throughout.